Brain injuries can be difficult to identify or diagnose, making legal claims arising out of negligence even more complicated. In many cases, personality changes, depression, mood swings and lack of capacity can indicate to loved ones that a victim has suffered a traumatic brain injury (TBI). 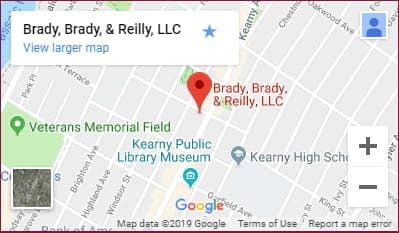 At Brady, Brady & Reilly, LLC, in Kearny, New Jersey, we are experienced in the investigation of accidents resulting in traumatic brain injury. Our priority is to help victims and families collect maximum compensation so that they can focus on healing and recovery. In many cases, a traumatic brain injury will not be identified for weeks or months after an injury. If you suspect that someone you love has been affected by a brain injury, it is important to consult with an experienced medical professional as soon as possible. Our attorneys work with experts who can investigate the cause of injury and identify all responsible parties. We will pursue maximum compensation for medical expenses, lost wages, long-term care needs and any other losses your family has endured. Do not settle without first consulting with an experienced attorney who can properly valuate your losses. These cases can be complicated and you may not have a clear understanding of how much your claim is worth. Our lawyers will work with financial planners and medical experts who will determine a fair settlement or verdict. At every stage, we will work to protect your rights and recover the full compensation you need and deserve. Free consultations · Evening, hospital and in-house visits · Spanish and Portuguese language services available · Se habla español · Call (201) 997-0030 or contact us by e-mail to arrange a case evaluation directly with a North Arlington brain injury attorney.